The Lagoon Nebula (the lower object) is a giant emission nebula in the constellation of Sagittarius located around 5000 light years from Earth. It is a HII region like the Orion nebula. 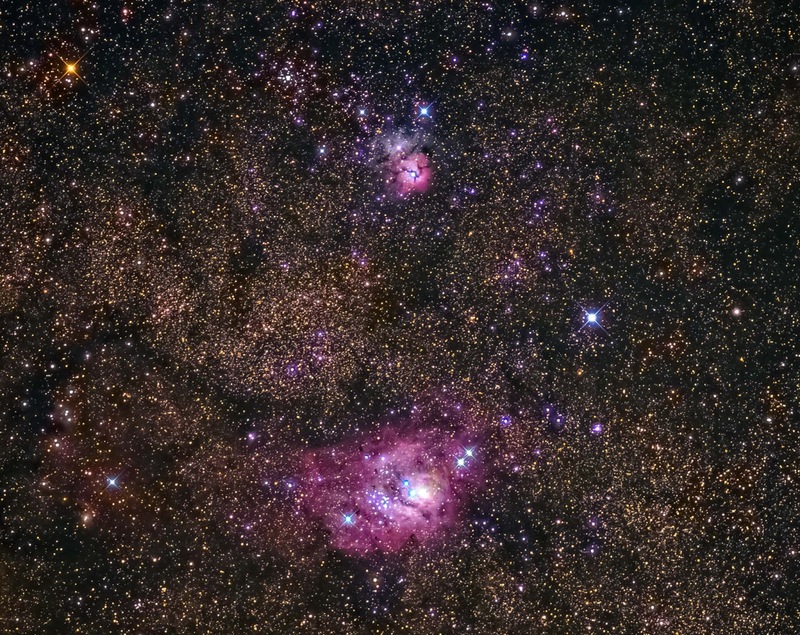 The Trifid Nebula (the upper object) is also a HII region, it is unusual in that the lower magenta portion is an emission nebula like M8, whereas the purple/blue upper portion is a reflection nebula. There is also a dark nebula which can be seen as the gaps in the emission nebula part. Again located around 5000 ly from Earth. Usual workflow, Stacking in Nebulosity 4, then PS & LR.